I am often asked what the typical Italian Christmas dinner is, and the truth is: there isn’t one. Every family has their own traditions depending also on where in Italy they live, so it’s hard to pinpoint a specific meal and say with certainty that it’s what most Italians will be cooking up and down the country on 25 December. It is, however, easy to guess what Italians from Turin to Palermo will be eating on their New Year’s Eve dinner: lo and behold, I give you the cotechino. Its origins are shared between Emilia Romagna, Lombardia, Veneto and Molise, all regions that suffer from very bitter winters. 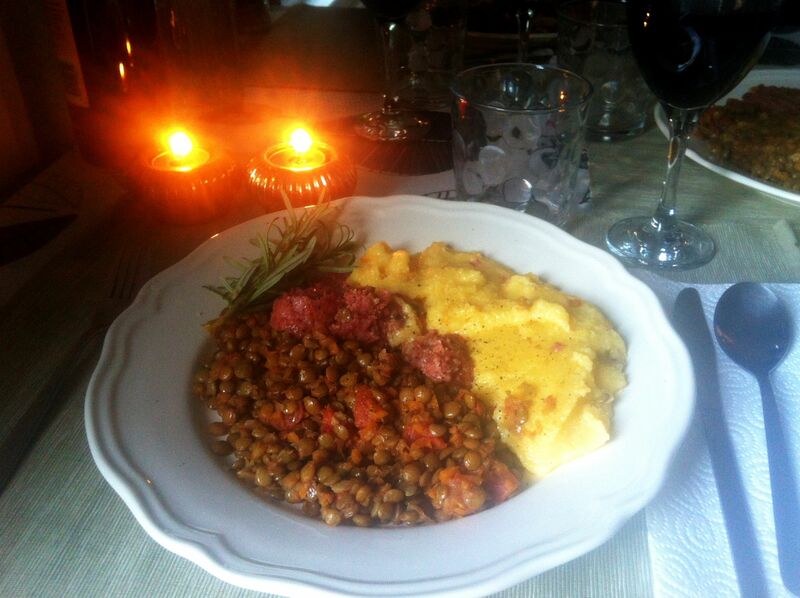 Cotechino (pronounced coteh-keeno) is therefore a hearty, filling dish that is served with polenta or mashed potatoes and always paired with lentils, which, according to the Italian tradition, bring good luck and prosperity for the whole year ahead. 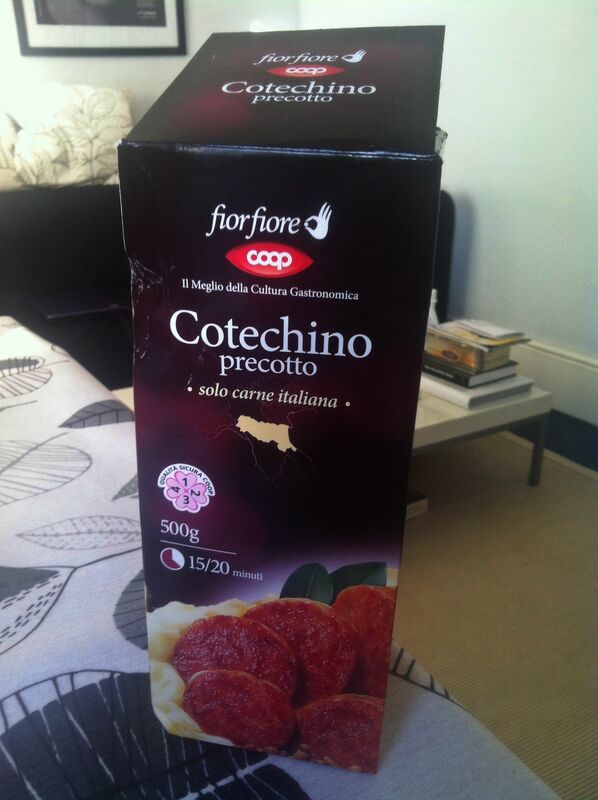 Cotechino is a sort of large salami made of pork meat, and its name derives from the word cotenna (rind). The traditional recipe consists of creating a salami of pork meat (in the past they used to stuff it with all the parts of a pig that wouldn’t get any other use) and wrapping it in pork rind, then letting it cook for several hours. Nowadays, however, most people buy the ready-made, precooked version of this dish, which doesn’t include rind and cooks in an airtight pouch for only 20 minutes. I served it with some instant polenta and tomato green lentils. Pre-cooked cotechino as it is sold at the supermarket. The outer box suffered a little during transport. I decided to introduce my partner, who is British, to this dish, and despite the initial hesitation due to the admittedly slightly startling description, he much enjoyed the richness of the meat. The very high fat content is not for the faint-hearted, but eaten once a year it’s a great tradition and one that I will love to keep up. This recipe served three of us very generously. Sorry about the steam, it was very hot and I couldn’t wait to eat it! Fill ¾ of a large sauce pan or a spaghetti pot with water, bring to the boil and put your cotechino, still in your sealed pouch, deep into the water, making sure it’s all covered. In a large frying pan place your diced onion and celery and sweat in the hot oil to make a soffritto. Once the contents of the pan are translucent and soft, but not brown, stir in the lentils, bay leaves and rosemary and mix all well. Let everything bind for a minute or two and add the tomatoes and just a splash (about 100ml) of water. Bring to the boil and then turn down the heat and cover, letting simmer for about ten minutes. Once ready, add a generous pinch of salt and pepper and keep warm. Bring the vegetable stock to the boil in a large pan. Slowly stir in the polenta, whisking continuously. Keep stirring over the heat for 15 to 20 minutes. You can add a little more water to make it the right consistency. Add in the butter, season and serve straight away, before it hardens by cooling. While you cook the polenta, take your cotechino out of the water after the 20 minutes’ cooking time very carefully, discard of the water and, once the airtight pack is cool enough to handle, cut it open with a pair of scissors and remove it from the meat, which should have a soft but firm consistency and the shape of a large sausage. 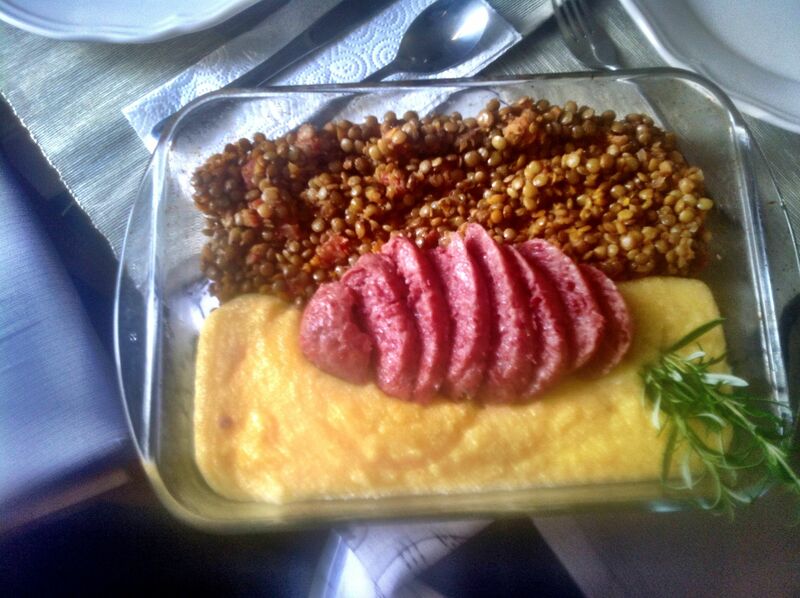 Once everything is ready, split a serving plate between the lentils and the soft polenta, and place the sliced cotechino on top. Make sure you serve this rich meal with a medium-bodied red wine, such as a Merlot or a Bonarda.